A little while ago, an update to the patch notes revealed hyperspace and multiple star systems as some of the features that will be in the next release. Patch notes being what they are, there wasn’t much detail, so I thought I’d write a post about how hyperspace works. First, perhaps obviously, hyperspace is a means of moving from one star system to another. The way it works is a ship transitions to hyperspace using a jump point, travels to its destination (another jump point, whether it’s naturally-occurring one or artifical), and then transitions back to normal space. Movement and combat in hyperspace work just the same way they do inside a star system. Well, not exactly the same. 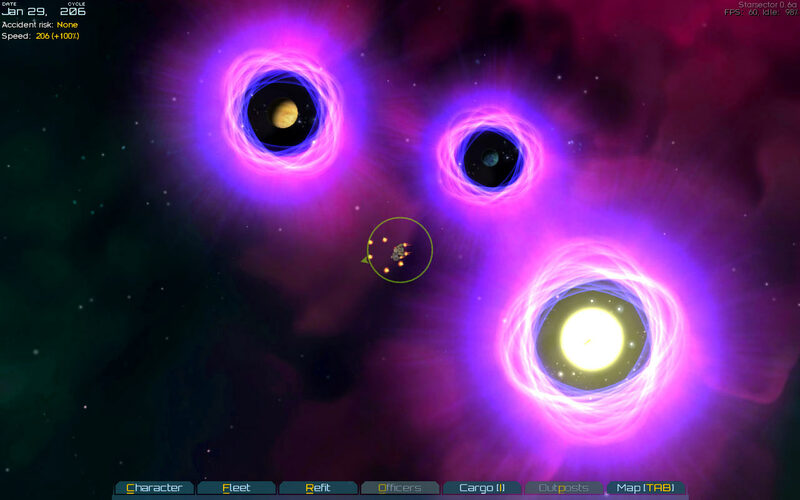 Movement in hyperspace also consumes fuel, based on the ships in the player’s fleet. For now, in the absence of an economy and only having two star systems, fuel is plentiful and cheap. Ultimately, it should become a significant limitation. For example, to explore distant star systems, the player might go out and create an outpost to stash fuel and supplies. They could then use a smaller, fuel-efficient fleet to poke around in the nearby star systems, resupplying as needed.